Prince Edward Island’s International Couple s Golf Festival, is not a competition, but rather a cultural immersion and introduction to kindred spirits of golfing couples. Cross the Confederation Bridge from New Brunswick and immediately feel the magic of this “gentle island”. While famous for Anne of Green Gables, the Big Break and the finest mussels in the world, PEI is so much more. Yes the mussels are superior but so are the oysters, haddock, halibut, scallops, and lobsters. There is no satiation point for their most succulent seafood which initiated the festival’s opening reception along with island music and Anne of Green Gables in female and crazy emcee male versions. Couples from all over Canada and the states, mingled, shared stories and anticipated the golf ahead. 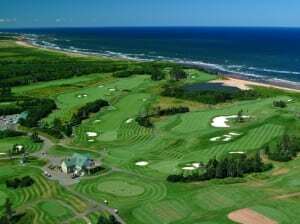 There are so many courses on PEI to play, you can stay for weeks. We started on the Links of Crow Bush Cove with Lisa “Longball” demonstrating how she achieved the long drive title with entertaining stories, swing tips and simple stretches that are a tad different, such as the windup and unwinding while firing guts at the flag. The finely manicured course, on a sunny day delivered outstanding island views, especially from the tips tee box on 11 – a 180 degree stretch of beautiful beach behind, balancing the daunting view of the hole ahead. When your drive clears the marsh in the middle, watch out for the many bunkers green side. Number 16 runs parallel to the beach with more ocean scenery from 17th and 18th tees before the homestretch. On Green Gables Golf Course, the author’s home is the aiming target for the drive on number 11 and a photo op from the fairway. Beware the lulled sense it gives as the next fairway then slants left to a marsh magnet. The parkland style course opens to the ocean on 13. Songs live from the Cavendish Music Festival, one of the top venues in the world, reverberated through the forest as we played. Many an oyster was sh ucked to complement the savory mussels and chowder after the round. Summer brings a tropical feel to the island and day 3 brought the rain that makes it so green. Dundarave Golf Course gave the option of playing, or returning two by two on Noah’s Ark shuttle back to town with rain checks (literally). Of course we played, every hole but 11 which was completely flooded except for the left part of the fairway. It was a second round with Anne, not of green Gables, and Steve who proved to be great sports. It was skip splash golf in steady rain with bunker lakes and the sound of rapids on the river. Still the beauty of the course shone through as logoed balls disappeared into deep standing water, waiting to become someone else’s souvenir. More steamed mussels rewarded our completed round until we were filled to the gills. The Delta Prince Edward Hotel is conveniently located in Charlottetown, connecting to the boardwalk waterside. Downtown Charlottetown is a historical representation of settlers who forged the foundational principles of confederation, the birthplace of the Canadian nation. No streets feel safer to stroll day or night with outdoor cafes and live music abounding. Live with Regis was readying for a broadcast. The festival concluded at Delta Prince Edward with a traditional Kitchen Island Banquet – a sit down lobster dinner that kicked off with a toast of island distilled moonshine in a cutout potato shot cup. Great food with new friends, playing the spoons and dancing with the down home island band was a perfect ending to a perfec t couples festival on PEI where surely most will return. 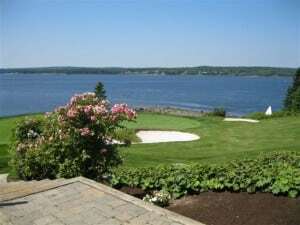 Go to www.golfpei.ca for vacation info. En route to PEI, stop at St. Andrews by the Sea. Kilted attendees greet arrivals at The Fairmont Algonquin, a grand hilltop hotel overlooking the bay. Fireside chats on the lawn with other worldly guests welcome the sunsets. This is the other St. Andrews, but the Algonquin Golf Course has been compared to Pebble Beach for the spectacular ocean views and especially number 12 which resembles Pebble’s number 7. Four tiers of elevated tees overlook the tiny green that juts into the sea. Bunkers guarding the front and shifting side winds make club selection tricky. Don’t be distracted by the crescendo of ocean view holes or you may need a rescue from the fescue. 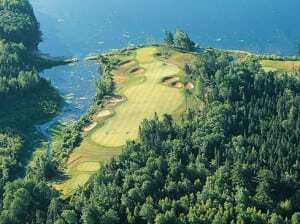 Atlantic Provinces beat the summer heat with great golf, food, views and fun.